The twain between my ACW posts and my day job at the Stimson Center have not met — until now. The following analysis, a trimmed-down version of which has been posted on Stimson’s website, seems way too wonkish to be confined there. On November 28, 2009 the Pakistani media reported that President Asif Ali Zardari “divested himself” of his “powers” as Chairman of the National Command Authority, transferring them to Prime Minister Yousuf Raza Gilani. Pakistan’s history has been marked by triangular jockeying among Pakistan’s Presidents, Prime Ministers, and Army Chiefs, as well as Constitutional gyrations facilitating Army, Parliamentary, and Presidential rule. Against this backdrop, does this change in the Chairmanship of the NCA have meaning? Are changes in the NCA and public releases of information about them helpful or harmful to nuclear stabilization on the subcontinent? General Pervez Musharraf is taking well-deserved lumps for his long tenure as Pakistan’s Army Chief, Chief Executive, and then President. But one undeniably positive result of his tenure was a stable, institutional structure for Pakistan’s nuclear decision making. Feroz Khan’s much awaited book about Pakistan’s nuclear history will delve into details; the short form is that Musharraf stood up a dedicated military organization, the Strategic Plans Division which was located at Joint Service Headquarters in 1999 to work on nuclear-related matters. A Nuclear Command Authority, chaired by Musharraf, was established in February 2000. The composition and functions of the NCA were clarified when Musharraf unilaterally promulgated the NCA Ordinance in December 2007, after he dissolved the National Assembly. (The text of this ordinance can be found here) It is not possible to tell from the public record whether the NCA design, as promulgated in 2007, differed from its initial conception. When Zardari replaced Musharraf as President of Pakistan in 2008, he nominally sat at the apex of this decision-making body. Under the 2007 ordinance, other members of the NCA serving under the President were the Prime Minister of Pakistan (Vice Chairman); the Minister for Foreign Affairs; the Minster for Defense; the Minister for Finance; the Minister for Interior; the Chairman, Joint Chiefs of Staff Committee; the Chief of Army Staff; the Chief of Naval Staff; and the Chief of Air Staff. 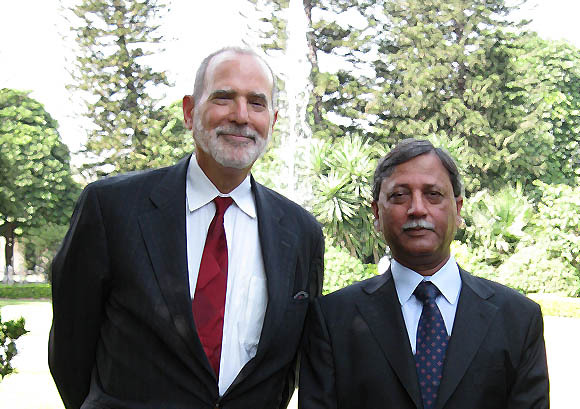 The Director General of the Strategic Plans Division, Gen. Khalid Kidwai (pictured above, with the author), has served as Secretary to the NCA since its inception. The scope of the 2007 ordinance covered space as well as nuclear applications and technologies. The powers of the Chairman included establishing “committees and entities” as he deems fit. Two Committees were previously announced: An Employment Control Committee, chaired by the President of Pakistan, with the Minister for Foreign Affairs as Deputy Chairman; and a Development Control Committee chaired by the President of Pakistan, with the Chairman, Joint Chiefs of Staff Committee, serving as Deputy Chairman. The Employment Control Committee’s membership mirrored that of the 2007 NCA Membership, with the notable variation in the number two slot. The Development Control Committee had a decided military cast. Presumably, the Chairmanship of these two Committees has now shifted to the Prime Minister, but there has been, as yet, no official word on this, on whether a new Vice Chairman of the NCA has been designated, and if so, who this person is, or whether the composition of the NCA or its committees have been changed in some other manner. The functions of the NCA, as spelled out in the 2007 ordinance, included the exercise of command and control over nuclear and space programs; supervision, management control, and audits of programs and budgets; authorizing “specialized scientific and technological work”; authority to hire, fire, promote and transfer personnel; personnel reliability, safety and security programs; and the authority “to take measures regarding employees in respect to their movement, communication, privacy, assembly or association in the public interest or in the interest of integrity, security or defense of Pakistan or friendly relations with foreign states.” There is no public word, as yet, on whether the language of the new ordinance comports with the 2007 version. Far more is known about the new NCA structure and functioning in Pakistan than in India. On January 4, 2003 the Cabinet Committee on Security issued a spare press release “on operationalization of India’s nuclear deterrent.” It conveyed the information that the Government of India had created a Political Council, chaired by the Prime Minister, which could authorize the employment of nuclear weapons. An Executive Council, chaired by the national security adviser, was also formed to provide inputs for the NCA and to execute the directives given to it by the Political Council. The membership of both Councils has not been officially released. Presumably, at a minimum, the Cabinet Committee on Security sits on the Political Council. India has a firmly entrenched Parliamentary system of government, which suggests that its NCA, unlike Pakistan’s is not subject to significant changes. Despite and because of Pakistan’s political upheavals, the Army has remained, by far, the strongest voice on national security matters, as well as the arbiter between contesting political leaders. Until these circumstances change, no matter which civilian sits at the apex of Pakistan’s NCA, the decision making power rests in uniform. Collective civil-military decisions remain ideal, but votes behind closed doors on crucial national security issues in Pakistan have always been heavily weighted. No government, including the U.S. Government, says much about its National Command Authority. One important reason for doing so is to improve deterrence. Another is to promote reassurance for domestic and international audiences. The Government of Pakistan might consider releasing more information to demonstrate institutional durability during a period of heightened political uncertainty. The Government of India might consider releasing more information to disabuse those who might think that a decapitation attack in extreme circumstances has any chance of success. If I were Pakistani or Indian, I might take offense at the tone of the post. But of course If I were Indian or Pakistani I’d probably be suffering from the reverse side of this coin called colonialism and find nothing amiss with patronizing sentiments from the sahibs. Ultimately, nations are either sovereign states or client states. Pakistan as a client state is more inclined to unhinder itself of a few of the more burdensome responsibilities of sovereignty such as state security secrets. India as a sovereign state jockeying hard to become a client state may become more inclined to be as forth coming as the Pakistanis with time. But let’s not pretend that they should do this in the name of anything other than subservience. @Azr@el: India and Pakistan, subservient, really?? Rejected the NPT, built nuclear arsenals, scuttled the CTBT, undermined the CD consensus (Pakistan, earlier this year), all in the the teeth of US opposition. Subservience should be made of weaker stuff! @Michael: There have been published news reports about India building underground shelters under the South Block as well as alternate command centres outside Delhi. That, I would suggest, is an easier way to strengthens deterrence (by increasing uncertainity about any decapitation strike option) and probably more viable politically than releasing more information directly about nuke C&C. Not that I would’nt like to know more about Indian nuke C&C . . .